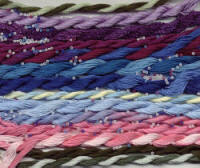 A three-ply divisible thread (72% viscose and 28% polyester), used for counted cross stitch, fine embroidery, and other needlework. 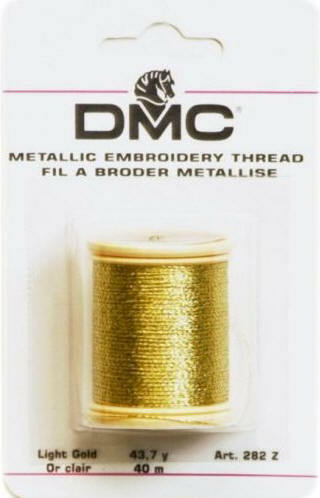 Remember when stitching with metallics to work with a short strand to reduce wear of the thread. 43.7 yards per spool. Blending Filaments, Cords, Cables, Braids, Ribbons and Ombre's are hand washable and dry cleanable. When ironing a finished piece containing Kreinik Metallics, do not iron directly on the metallic thread. Use a cloth. Do not use steam. Blending Filaments, Cords, Cables, Braids, Ribbons are also machine washable and can be tumble dried on a low setting. The Very Fine (#4), Fine (#8) and Tapestry (#12) come on a snap-spool mechanism. Both sides of the spool open; look for the side where the thread end is located. Insert your thumbnail under the cap, and rotate the spool while gently lifting the cap to release the thread (the cap should not pop off). Snap the lid shut to secure the unused portion. • The Medium (#16) and Heavy (#32) Braids have a lock-flange mechanism: the thread 'locks' in the groove around the top of the spool. Simply pull the thread to release. Wrap the thread in the groove to secure the unused portion . • Use short lengths of thread—about 45cm (18 inches) or less—to avoid excessive abrasion when pulling the thread through the ground fabric or canvas. The more we pull a strand through fabric or canvas, the more 'wear' it causes on the thread. Using shorter lengths will maintain the quality of the thread, plus reduce tangling as shorter lengths are easier to control (less knotting!). • If you are stitching on fabric, use a needle large enough to 'open' the hole in the fabric sufficiently and allow the thread to go through more easily. • For a quick-and-easy, take-anywhere threading technique, cut a small strip of paper and fold in half. Place the fold through the eye of the needle and open the two ends to insert the thread in between. Gently pull the paper through so the thread is brought with it • You may wish to moisten the braid with a slightly damp sponge, or moisture from your own hands after rubbing them together, to help relax the thread and thus reduce twisting and knotting. • The way we twist the needle as we stitch, combined with the twist of the thread, can cause any thread to twist on itself. Stitch slowly for greater control, and let your needle hang frequently to let the thread untwist.